A finance themed event for beneficiaries. 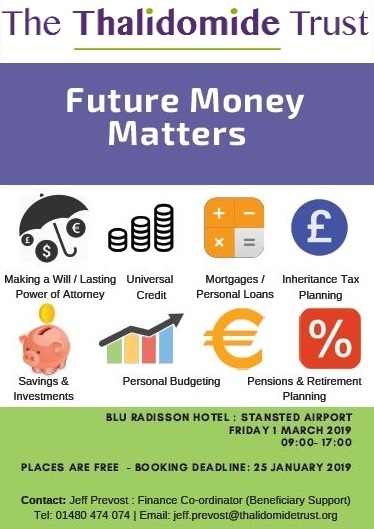 Future Money Matters is a finance themed event for beneficiaries that will provide you with up to date information about a range of important financial topics, as well as the opportunity to meet with the various finance professionals that will be attending on the day. The event is also a great way to meet up with fellow beneficiaries, and there will be time set aside within the day’s agenda to enable you to meet up and socialise with each other. Beneficiaries will have the opportunity to attend up to three of these topics in the morning session. In the afternoon, the event will provide you with the opportunity to pre-book a confidential one-to-one meeting with the financial specialists that will be attending on the day. In addition to this staff from the Trust’s finance team will also be available for one-to-one meetings if you would like to discuss anything in relation to your Trust Grants, payments and Advances, or other financial matters. Running alongside the one-to-one’s will also be an open afternoon session creating an informal and relaxed environment for you to meet and socialise with fellow beneficiaries and Trust staff that will be attending on the day. How can I book a place at the event? Do I have to pay for my own travel and accommodation? Yes, beneficiaries will need to meet the cost of their own travel to and from the event, and accommodation if they wish to stay overnight. The Radisson Blu Hotel have provided the Trust with a discounted room booking option for beneficiaries that would like to stay overnight. Please click here. If you have specific room requirements, please contact the Radisson Blu directly. If you would like to view a list of other hotels with accessible rooms located close to the Radisson Blu then please click here. The event is free for you to attend. Refreshments and lunch are also included. Do I need to attend the full day? No. If you would like to attend for part of the day that is fine. Please indicate this on your booking form (in additional info) so we can plan catering requirements. Can I bring anyone with me to the event? Whilst the event is designed primarily for beneficiaries of the Thalidomide Trust, we recognise that some people may wish to bring along a family member, carer or a personal assistant. Whilst we do not wish to discourage others from attending, there will not be a separate programme arranged for them, but they are welcome to join in any of the sessions. A maximum of two additional people can attend with you if required. What did beneficiaries say about the 2018 event? Well, our 2018 Future Money Matters event was a great success! Held on 10 May at the Hilton Metropole Hotel in Birmingham the event received lots of positive feedback from the beneficiaries that attended, but most importantly it helped beneficiaries to obtain relevant and helpful financial information covering a range of important topics, and gave them the confidence to take some really positive actions. 5 beneficiaries took steps to put a Lasting Power of Attorney in place to safeguard their financial future. 6 beneficiaries had follow up appointments with ‘Caple Banks’ to look at setting up investment opportunities, personal trusts, pensions, and ways of protecting assets for their children / families. 2 beneficiaries made post event contact with PWC to obtain advice and guidance on VAT exemption and planned building works to their properties. 7 beneficiaries had post event appointments with the ‘Centre for Financial Education’ regarding their pensions and retirement planning. “The one to one meetings were fantastic – financially life changing”. “The event helped me to review the existing plans I had in place. Caple Banks were extremely approachable, reassuring and also knowledgeable about the Trust, and that helped encourage me to review the existing personal trust arrangement I have in place. I didn’t think I would get as much from the event as I actually did”. “I found the event very useful especially about retirement, pension and power of attorney. I am now thinking of retiring in the next two years. I am reducing my work hours to part time now and I’m not going to take my lump sum pension until I retire fully. I haven’t done power of attorney yet – but I am thinking of doing this online”. “It was nice to hear that the external speakers already had a relationship with the Trust and some beneficiaries too, which meant following our one-to-one meetings, we now intend to make further appointments”. “You could not have been more caring, welcoming and accommodating at this event, thank you”. “Having attended the event, I will now be making contact with two of the external speakers”. The deadline for booking your place is Friday 25 January 2019. If you have missed the deadline please contact the Trust to confirm if places are still available. Who can I speak to, to find out more information about the event? Please enter your details here with any dietary requirements we need to know about. Please provide details of your guests here. Every beneficiary can have up to a maximum of 2 guests. Do you want a 1:1 with a financial specialist? There are a number of disabled spaces opposite the main entrance plus a number of standard spaces. Parking is £6 per day (up to 8 hours) or £12 overnight. Some morning group sessions will be recorded for information purposes. Are you happy to be included in the filming?